VJAMM Fundraiser at Hama This Thursday! - Yo! Venice! Home Venice Beach California VJAMM Fundraiser at Hama This Thursday! VJAMM Fundraiser at Hama This Thursday! 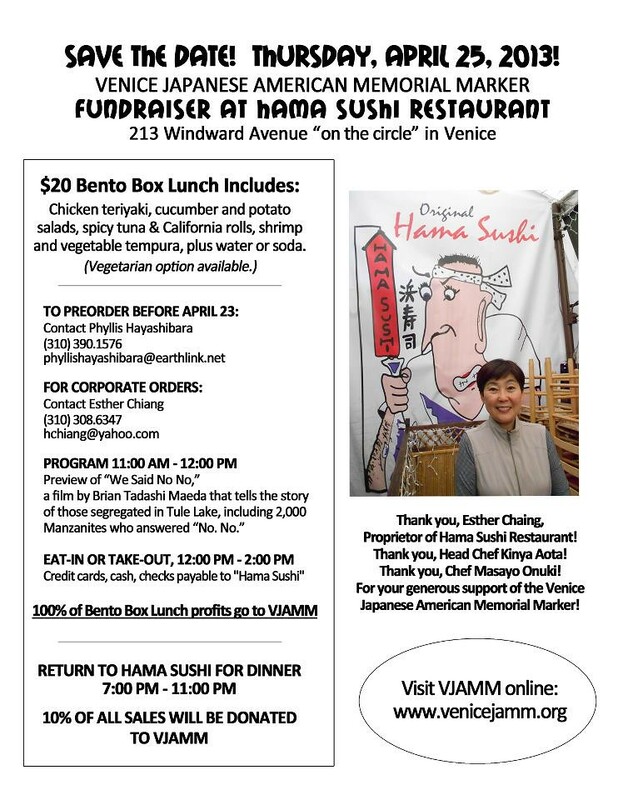 On Thursday, April 25th, Hama Sushi at 213 Windward will be fundraising for the Venice Japanese American Memorial Marker (VJAMM). The fundraiser will include speeches and presentations from 11-12, but the fundraiser lasts all day long! The Venice Japanese American Memorial Marker will be placed at the northwest corner of Lincoln and Venice in observance of the horrific Japanese American internments which started in 1942. From 11-2pm, 100% of the profits (eat-in or takeout!) from their lunchtime Bento Boxes will go to VJAMM! Bento boxes include chicken teriyaki, cucumber and potato salads, spicy tuna and California rolls, shrimp and vegetable tempura and water or a soda for $20! Vegetarian options are available too! From 7-11pm, 10% of all sales will be donated to VJAMM! 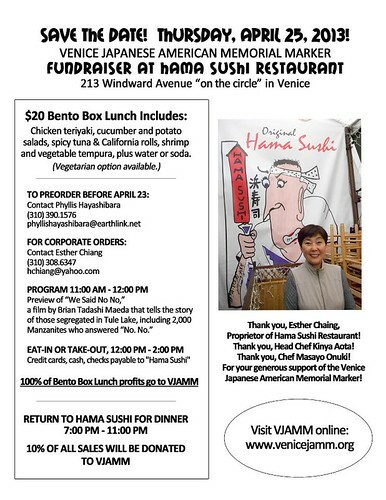 Please support VJAMM by having lunch or dinner (or both!) at Hama on Thursday! Bento Boxes can be ordered for your entire office to go! Pre-order your meal by calling 310.308.6347!